Lessons from being stranded in the U.P. 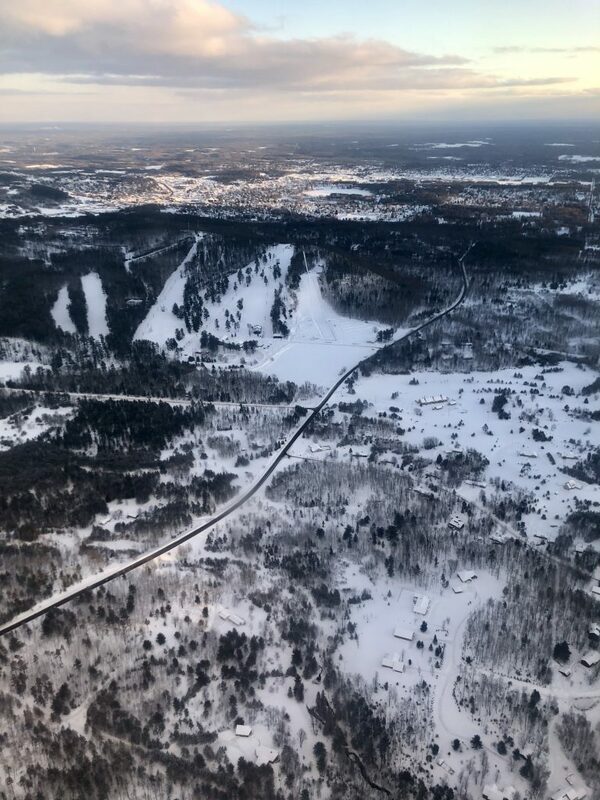 Flying over the small U.P. town I grew up in. The foreground is the skill hill, which hosts one of the largest international ski jumping competitions. I recently trekked to the U.P. after my grandmother died to spend a weekend celebrating her life with my family. Sometimes, especially in the winter to avoid blizzards and other weather fiascos, I’ll drive over to Detroit, where my younger brother lives, and we’ll fly home. There is actually a daily direct flight from DTW right into the small “airport” in my hometown of Iron Mountain/Kingsford. Usually, this is a great process that gets us there and back quickly without having to spend an entire day traveling. That is, until the runway freezes over. As we were driving to the airport Monday afternoon so we could arrive a whole 10-minutes early (that’s how small it is), I got the dreaded notification on my Delta app: your flight has been cancelled. Since we were already in the car, we decided to head there and see what was up. Turns out, it was so cold airport officials were unable to clear the runway of ice. In fact, no flights had come or gone since Saturday. To make matters even worse, we weren’t going to be able to fly out until Wednesday night – a two whole extra days of unplanned time. The next couple of days resulted in many phone calls, app-checking moments, freak-out moments, stressful moments and just sheer annoyance on my end. However, there are a couple of good lessons I learned during this time. I’m a bit high-strung and don’t always appreciate when a plan is derailed. When we got the notification about the cancellation, I could see my mom looking at me like “oh, no – he’s going to lose it.” And frankly, I almost did. However, if working at SPR has taught me anything, it’s to be flexible and stay calm under pressure. Sometimes, you just have to accept the situation and instead of getting upset on what happened, find a solution to fix it. One thing that really stuck out to me was how important it is to rely on the humans around us. My brother and I immediately made a connection with Rachel at the counter, who was kind enough to help us rebook. After another flight I tried to jimmy up to Minneapolis/St. Paul and then to Detroit was cancelled, the app wouldn’t let me rebook so I had to talk to a very nice gentleman at Delta’s service center. I know we all love technology and avoiding interaction with a human being, but sometimes going straight to the source will get you what you need more efficiently than an app. In an age of where we’re interacting less and less with those around us, it was refreshing to talk with real humans who were sympathetic to my issue. And when I spoke to the representative at the Service Center, I made sure to throw in a couple of jokes about being stranded, which he appreciated and actually upgraded my seat, resulting in having the whole first row to myself. The point is, when there is a situation, it’s generally a good rule of thumb to approach people with kindness because you’re probably going to have a better result in the end. While I was frustrated about the situation, in some ways it was a gift to be able to spend a couple extra days with my family. My mom was definitely not complaining that my brother and I were there for that extra time. Though I was working from home, we ate lunch as a family and had dinner each night – and usually a subsequent card game where I lost profoundly. So even in the most irritating situations, there is something wonderful to be found in them – you just have to look on the bright side. I definitely have had my share of travel fiascos, but this one was up there. However, it was a good lesson in patience and having to rely on those around me, including my incredible teammates here at SPR, who were SO kind to ship documents over, take calls and help me work remotely from the Great White North. Have you learned anything from traveling? Let me know in the comments below! PS: I wrote another blog on some lessons I learned traveling in Europe, which you can check out here.